Normally I would make my pastry by hand, just like my granny, but I thought I’d give it a try in the VonShef as I wanted to put it through its paces. I can confidently report that it’s a lot easier and faster using the food processor method, though there is a bit more washing up to do. All I had to do was throw the ingredients into the bowl of the food processor and press a button. Well that maybe over simplifying it slightly, but not by much. I added the flour, butter, salt and nutmeg first and blitzed for a few seconds. Then I added the yoghurt and whizzed for a few more seconds until the mixture gathered itself into a dough. If you’re wandering about the yoghurt, I generally use it to bind my wholemeal dough, which is otherwise tricky to handle. It helps to make a flaky and very tasty pastry turning Granny’s apple pie into even more of a treat. I prefer wholemeal pastry as it’s not only much healthier but has a nutty quality to it which enhances the flavour. Coincidentally, it was pastry week on The Great British Bake Off on Tuesday. Some of the pies looked and sounded fantastic. I feel I now need to make a savoury pie and have a go at pasteis de nata, otherwise known as Portuguese custard tarts. However, I’ve noticed no-one on #GBBO is ever brave enough to make wholemeal pastry. Once you’ve made the pastry, all the work for Granny’s apple pie is almost done. This is a super simple recipe which requires no pre-cooking of the apples. Simply slice them up and add a bit of sugar. The only fiddly bit is cutting out pastry decorations. The bit of pastry you can see looking lost on the top was my inept attempt at a leaf. I must try harder. Apple season is now in full swing. I’m finding apples everywhere I go. Colleagues are bringing them into work, I see help yourself boxes of them sitting on people’s doorsteps and best of all I have the next door neighbour’s apples falling into my new garden. I do love autumn. The pastry was beautifully flaky and crisp on the bottom. No soggy bottoms for me. Now that Mary Berry is no longer part of #GBBO, maybe that’s now a thing of the past anyway. The pie is wonderful eaten hot straight from the oven, with or without clotted cream or custard. But it’s almost as good eaten cold the next day. My aunt recently told me she’d been having problems finding a food processor that had stainless steel attachments rather than plastic. I’m pleased to report that the six chopping, shredding, slicing and grating blades that come with the VonShef 1000W Food Processor are all made of stainless steel. The only plastic attachment is the dough blade which I used to make Granny’s apple pie. The bowl is bigger than my last food processor (3.5 litre capacity), but it’s a lot more compact than you might think and doesn’t take up much more space. It’s taller than it is wider, but still sits comfortably on the workbench and under the kitchen cabinets. It does everything you’d expect a good food processor to do and comes with a 1.8 litre capacity blender jug. Smoothies are very much an option as are soups, dips, sauces, coleslaw and any number of other delights – including pastry of course. It has a two speed control for versatility plus the ever useful pulse function. My absolute favourite feature is the handy drawer at the bottom which holds the attachments. No longer do I need to hunt around in the back of the cupboard every time I need to change the grater to a slicer or chopper. They all fit snugly into the drawer and will never be lost again. The 1000W motor is powerful so it has an in-built thermal cut-out device in case the food processor begins to overheat. You can buy the VonShef 1000W Food Processor online via Domu for £59.99. A simple but super tasty apple pie made with delicious flakey, buttery wholemeal spelt pastry. Insert the dough blade into the bowl of the food processor. Add the flour, butter, salt and nutmeg and pulse until the mixture has formed something resembling rough breadcrumbs. Add the yoghurt and switch to speed 1 until the mixture has formed a dough - about 20 seconds. Halve the dough and roll out to about 4mm thick. Line the bottom of a 22 cm pie dish and trim the edges to fit. Whisk the cinnamon into the sugar or or place in a jar and give a good shake. Layer in the apples and all but 1 tbsp of the sugar. It's best to mound them up higher than the dish as they will sink when cooking. Roll out the remaining pastry to about 4mm thick and cover the top of the pie. Trim the edges and crimp the sides or use a fork to press the pastry together. You can also use some of the pastry scraps to create some decorations to go on top. Sprinkle the remaining sugar over the top and slash the pastry in order for some of the steam to escape. Bake in the middle of a preheated oven at 200℃ for about 30 minutes or until the pastry is golden and the apples are soft. Serve hot or cold with clotted cream or custard. Any remaining pastry will keep in the fridge for a couple of days or it can be frozen. The Great Bloggers Bake Off 2017 hosted by Mummy Mishaps. If these aren’t enough to tempt you, head over to my Tasty Tarts & Pastry Pies board on Pinterest. You’re bound to find some inspiration there. If you make my Granny’s apple pie, I’d love to hear about it in the comments below or via social media. A photo is always good too. For more delicious and nutritious recipes, follow me on Twitter, Facebook, Instagram or Pinterest. Granny’s Apple Pie. PIN IT. Domu is kindly offering one Tin and Thyme reader a VonShef 1000W Food Processor worth £59.99. To be in with a chance of winning, please fill in the Gleam widget below. You will need to leave a comment on this post, answering the question, which then gives you additional chances to enter if you so wish. Gleam will pick a winner at random from the entries received who will then be contacted via e-mail. If you are commenting anonymously, please give me some way of identifying you as I will be verifying the validity of entries. Any automated entries will be disqualified. This giveaway is only open to those with a UK postal address. Winners will need to respond within 5 days of being contacted. Failure to do this may result in another winner being picked. There are no cash alternatives. The VonShef 1000W Food Processor is offered and provided by Domu and Tin and Thyme accepts no responsibility for the acts or defaults of said third party. Tin and Thyme reserves the right to cancel or amend the giveaway and these terms and conditions without notice. I was sent the VonShef 1000W Food Processor to try out. I was not required to write a positive review and all opinions are, as always, my own. I would be dying to make a warming and comforting Apple & Blackberry Crumble! I would use it to grate my abundance of courgettes from the garden and make lots of spicy courgette fritters to freeze. Oh well done on your courgettes. We didn’t grow any this year and the young plants were all eaten last year – I really missed wondering what on earth I was going to do with them all. I’m dying to make my favourite spinach pesto and also a nice raw vegan chili.. I haven’t got a food processor at the moment so winning one would be amazing for me! Oh raw vegan chilli sounds interesting Laura. I’m going to have to investigate that. And produce pastry that isn’t soggy and wet. Hahaha Lynne, that’s brilliant. If it was all about the talent, you’d be winning this for sure. You’ve definitely won a new follow on Instagram though. I am dying to make my own coleslaw wit red cabbage! I would love to make my husband’s favorite pie when he was growing up, but it is a lot easier to chop up and mix the cookie crumb crust in a food processor! The apple pie looks fantastic with 100% whole spelt flour. Thanks Angie. I pretty much always use wholemeal spelt in my pastry. In fact I’ve never tried making pastry with only white flour. Mmm what a delicious pie, I must try making pastry in my vonShef food processor! It would have to be pastry for a beef & onion pie I really fancy one! I’d love to make spicy tomato and grilled pepper soup in preparation for the cold winter evenings! i would make a yummy soup. I would love to make Maca Macaroons and Keto Chocolate Chunk Cookies. We have an apple tree groaning with the weight of apples so I’d make some apple coleslaw and the food processor would save me chopping by hand.We also have a lot of pears so I could use it to make apple and pear crumble. Pineapple Upside Down Pudding, my fav! A chocolate fudge cake because it’s chocolate. What’s not to love? Your apple pie looks amazing. I’d definitely have to give that a try. I love making chutney but preparing the fruits and onions by hand takes ages – this would speed things up so much! To be honest I’ve never used a food processor and have always been intregued to know if pastry made in a food processor is as good as that made by hand. Looking at the pastry you’ve made for your apple pie it certainly looks to be as good. Love the idea of using yogurt in the pastry too – sound gorgeous! I mostly make my pastry by hand, but it’s just as good in a food processor and possibly better. We would try making pesto. Did you read the news yesterday about how ready made pesto is higher in salt now than a few years ago? Shocked me into thinking we really must make our own. I mean, I like salt, but there’s a limit! Yes I heard that Judith. I think that’s true of most ready made items. Homemade is generally best, though not always convenient or even possible. Interesting recipe. The food processor would be great for making the pastry. I’m dying to try making my own pastry rather buying ready made in all that packaging and with who knows what in it – palm oil for one! 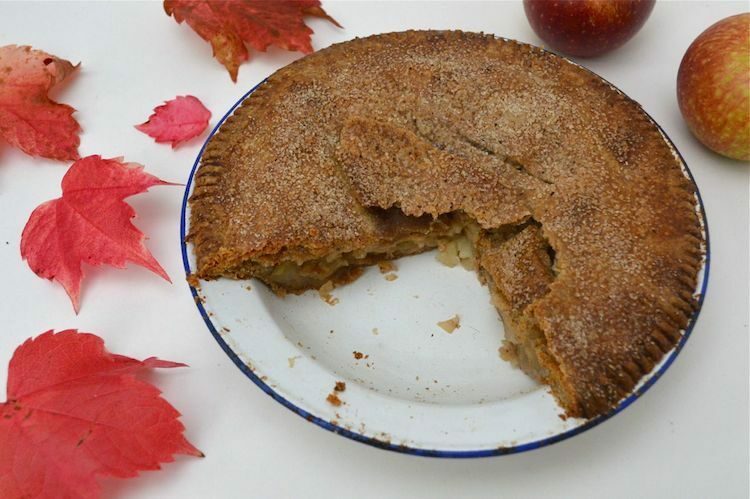 wow, awesome giveaway, loving the apple pie, you made, making my mouth water! I personally would love to try and make a bread, like a sundried tomato bread, this is my fav and you cant buy it in the shops, so its up to me to make! Thanks Karen. I’ve never tried sundries tomato bread – sounds delicious. I’d use it to make roasted butternut squash and red pepper soup. I made some earlier this week and used a hand blender to blend and ended up with soup splashes everywhere to clear up! My mum used to make wholemeal pastry and I grew up on it so I definitely prefer it to plain white pastry. I will have to get some spelt flour to try your recipe and try adding a little yoghurt as it can be difficult to work with and I often find my finished bakes look a little more ‘rustic’ than I’d like! Thanks so much for sharing with #CookOnceEatTwice. Snap. I grew up on wholemeal pastry too and I love the texture and flavour of it, but until I discovered the yoghurt trick I used to hate making it. WOW this would be wonderful for making tasty homemade soup! I would like to make an apple and blackberry crumble and think the food processor would make it easy. ideal for my bread making efforts and fruit cake! I find creaming butter and sugar together rather messy and sometimes tiring so every baking recipe that I have that starts with the words cream butter and sugar. This would be fab for making everything from soups to cakes & pasrty. I’d go for a vegan version of this recipe – with hard vegan margarine / fat (Tomor or Trex) instead of butter and soya yoghurt instead of dairy yoghurt. I would use the processor to make some homemade veggie burgers. A lovely crumble. Would make it so easy. It would enable me to make some hearty vegetable soups just in time for the winter. This would be useful to me because I have been making my pastry by hand and this would speed up the process for me enormously. I would make an Eve’s Pudding with the apples we have on our apple tree in the garden. Ooh yum. I haven’t made Eve’s pudding for years. A bit boring but I would use it to grate. I love grating but always fear for my finger tips! I’d make lots of different soups – it would certainly speed up the process! It would also be great for the pastry when making my home-made glutenfree mince pies. I would use it to make courgette & lemon soup & home made bread rolls to go with it. Thanks Jo. Pastry used to be my nemesis until I discovered the yoghurt trick. I’ve only ever made wholemeal pastry though – or sometimes half and half. Energy bars! I’d love to be able to whizz up a load of dates and nuts, then just add any flavours you like and you’re done. That would be fabulous. I make loads of energy balls now – it’s so easy with a food processor and they are so delicious. I would love to make my own curry pastes – went on a Thai cooking course and haven’t been able to manage any of the recipes at home because a mortar and pestle doesn’t quite cut it (literally!). bean burgers, vegan ‘cheesecake’ and flapjacks, fruit crumbles and pastries. My very good friend is vegan, and I would love to make her a 5 course meal, including a big cake! I love the fact this is such a healthy pie recipe! Apart from being delicious:) I’ve been using spelt four lately myself with good results, but haven’t tried the wholewheat version. Thank you for bringing your lovely pie to #CookBlogShare! It would be perfect for making a good cheesecake! Perfect for grinding the base and then afterwards mixing or grinding the nuts for the topping! Carrot Cake would be exciting or Cheese Cake! Yum! I would like to make Jamie Oliver’s snack balls, this would crush the ingredients brilliantly. I’d love to make hummus in a food processor. I would use it to grind the breadcrumbs and cheese to top stuffed mushrooms. It takes ages to do it properly by hand so this would solve the problem. Well now winter is fast approaching. I think is time to makes some warm hearty soups. Mine has to be tomato soup. would love to make a nice pea and ham soup with my own ingrewdients – a food processor would definitely come in useful for that!! A nice warming vegetable soup. I would love to make my own pie after seeing that one! I would also love to make my own coleslaw too! I’m really keen to start making my own hummus and experimenting with different flavourings like caramelised onion or harissa! Love to win this,I need all the help I can get in the kitchen,love to cook. Oh goodness. One working arm sounds hard. Good luck with the giveaway. i would like to win becuase i cant make pastry and i need help! oh I do love an apple pie, and I’m loving how neatly you’ve laid your apples! I haven’t made an apple pie this apple season yet, and we have so many apples! It must be time to make one Helen. Nothing quite beat an apple pie. I would use it to make a bearnaise sauce for our favourite family dinner. After wearing my wrist out and spilling half the butter all over the hob, a helping hand from a brand new VonShef will save me from trying to be ambidextrous. I’d use it for chopping and grating the homegrown ingredients for coleslaw. I think pastry is unbeatable in the food processor . Unfortunately I have only ever had a mini processor and that really doesn’t work for pastry! I would use it for chopping lots of vegetables to make a lovely vegetable soup. I know exactly what you mean Jo. A food processor definitely helps. When hubby bought us a stand mixer I made the mistake of getting rid of my ancient food processor which made great pastry. I’ve not made any good pastry since. An apple crumble sounds a fab idea! This food processer would be so handy. I would whip up everything from curry pastes to soups, hummus to chopping lots of veg. They’re also great for combining butter and flour for pastry. I would love to attempt to make a vege soup, and to pursue a healthier lifestyle of more homecooked meals and tasty healthy food. Pastry for pies! I just find it so time consuming to do it by hand and I want to make my own pies again. I’d love to make my own nut loaf but have always been put off by the amount of nuts that need chopping, so this would be perfect! I would use it to make a variety of soups. Finally started making homemade soup and my husband loved it! There are a lot of different bread recipes I have collected over the years that I would love to try, such as Portuguese rolls. I am always put off by the kneading process. I always struggle with all aspects of it, like the mess is creates and simply the amount of effort it takes. So, if the dough blade works as advertised, I would be willing to make bread much more often. It would make making breadcrumbs so much easier – I make my own for coating fish and chicken as I need gluten free ones. Also nut-roast would be much easier. Inspired by my eldest son I have, over the past year become a vegan and I am finding vegan cookery quite time consuming. A food processor would speed up the preparation of salads with a lot of grated veg and bean burgers or bean and walnut spreads. It’s pastry for me. I haven’t got the patience to do it and a food processor would save time! I have loads of basil and really want to make pesto but need a food processor !! 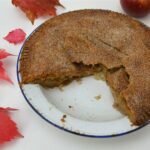 I am definelty going to bake this apple pie, i love that youve used wholemeal flour. I would make a nice apple crumble with the kids as they would enjoy making it and eating it. I’m dying to make my mums meat and veg plate pies but I can’t use my right hand very well anymore so this would be heaven. I’d love to make my own pesto, to go in a goats cheese linguine! I’m dying to do pastry again. My last processor blew up and my hands just aren’t cold enough. Using it to make my pizza doughs,so much better that shop bought. I’d like to try making different nut butters, and this is definitely a job for a processor! I still have a glut of end of season tomatoes in the green house and this would be great to whizz up a soup. I’m dying to make my own pork pie this christmas. I have no fears about the hot water crust pastry – I’ve made it before, & it soooo easy to handle! I think it would be nigh on impossible to mince the meat & mix without a food processor though, and I don’t want big chunks. I do a lot of home cooking, but am yet to really master baking, so this would be fab and i would try out cherry pie for hubby first! I’d love to be able to make decent shortcrust pastry and I’ve heard how good this machine is for pastry. This looks a great bit of kit, I would love to give ti a go. I’d like to make an apple crumble with a food processor as I’ve seen it on TV, when I try to do it manually my hands are a bit warm and it’s more like pastry! I’d like to make nut free pesto so my husband can actually eat it! I’ve been inspired by this year’s bakeoff and want to start to bake some more so this would come in really handy. Rhubarb crumble or apple and raspberry crumble! I’m dying to make home-made naked slaw, and this would save so much time chopping up veg! I would love to make soup so would find this really useful, and crumble for pudding! We love apple pie with custard but we have never tried a different flour, looks yummy. Would use it to make a delicious rhubarb crumble, when I do it by hand the crumble is never small enough as my hands are too hot. We love homemade pasties with all sorts of savoury and sweet flavours. The kids are always asking for them but they take me forever to make. I’ve used ready made pastry a couple of times when I’ve been really busy but they can always tell and they’re none too happy about it! This would speed up the pastry making part no end and I could even use it to chop up the fillings. Then the only time consuming bit will be rolling it out. Do you think they might invent a Vonshef with a rolling pin attachment too?! Haha. I’m waiting for the day when we have robots that can do all the chores leaving us with just the fun bits. I love making soups and this would be perfect! I’d love it to make all types of pastry – I have really warm hands and so rather than rubbing the butter in, I tend to melt it in which doesn’t make for a good bake. There is something very comforting and homely about apple pies’ This looks really delicious. I prefer making sponges – I always struggle with pastry! I would love to be able to make it properly. I would love to use this to make some nice winter homemade veggie soups. Thanks for the lovely giveaway, your apple pie looks lovely. Love to make lots of curry pastes from scratch. We’re big fans of curry. The one gadget that I don’t have. I would love to make some salmon Thai fishcakes. This would be great for mixing the ingredients, making breadcrumbs etc. I’m so envious of your walnut crop. Fresh walnuts are delicious. Soup – you really need a blender thats enclosed to zizz it up in and I have a few soup ideas I want to try out! I’d use it to process lots of veggies into sauces to persuade my children to eat more vegetables with their meals. Energy Balls! Especially cocoa/mint or date/nut. I pay ~£2 a pop for them on the go, so to be able to make them at home instead would be amazing! I really want to make smoothies! Banana and avocado with some milk or almond milk. Perfect breakfast! I usually mix cakes by hand, but would like to try a food processor. Also for things like grating carrots for a carrot cake. I’d love it for the perfect soup – one my daughter wouldn’t be scared to eat! I would love to try make a gluten free pie as they are so hard to come by! I’d love to try to make homemade pesto – I love a simple spaghetti with pesto and to try a homemade one would be fab! It is coming up to soup, soup and more soup weather (I love soup). One of these would be ideal for getting the smoothness I require of my veggie soups. Or the crumbles for a nice warm winter berry crumble. I would love to use this to whizz up soups. I’ve been wanting to make soups for ages, but don’t have a blender/food processor to do this. I would use it to make spicy carrot and lentil soup – lovely and warming on a cold, dark evening. This is boring but true – I’d be dying to make home made cheese and onion pie. Onions by hand have a really bad effect on me. My gran used to make me one, it was so gorgeous but nobody since. I’ve tried to persuade my sis who is a MUCH better cook than me to do it but she’s having none! I am dying to make my Christmas puddings and Christmas cake and a food processor would be so useful for the breadcrumbs, chopping nuts and generally mixing it all together. Using one to help make healthy cauliflower rice would make this a much quicker meal to prepare! A really good vegetable soup, chopping just doesn’t do the job! I would love to make a cauliflower rice – I’ve never tried it before, let alone made it so it would be good to try! We are trying to cut down on our meat consumption at the moment, and I’ve been wanting to make my own falafel. Would love the processor to try some different recipes out! It would definitely be something warm like soup. Coleslaw! I hate the chopping, it takes ages and with a food processor it would only take a few minutes. I’d love to use this to make some corned beef pasties. I had a lovely home made one off a friend today and it was delicious so I’d like to try and make some the same. would love to try making my own pastry – for apple pies and other treats. I would love to win this so I can try out your recipe! My family loves apple pie! I would love to make some hummous! homemade chicken teryaki dippers! It’s impossible to blitz the chicken breast without a food processor – i tried using my blender and blew up the motor! I would like to make a traditional Christmas Cake instead of buying one. This processor would really help make it turn out right. Fruit Crumble is always a welcomed treat this time of year. Blitzing the crumble mixture in a food processor would save time and ensure an even and fine topping. The prize looks nearly as nice as that pie. That would be the first thing I made with it thats for sure. I would like to use it to make my own coleslaw as chopping by hand is so tedious! I thought I’d already commented on this! I love old-fashioned apple pie, and yours looks fab, especially with the spelt pastry. I bet it’s so filling too. I’m so looking forward to moving back to Britain… not least because it means I can retrieve my Magimix from storage! I hate making pastry by hand, I really do! Hahaha. I understand the pastry thing completely. I used to avoid pastry making like the plague. I’d make chocolate cake and leek and potato soup….Though not at the same time of course! :O Perish the thought! Haha! I like to make huge pots of vegetable soups for the winter. I freeze them in individual portions to make quick, easy meals. This would make the job even easier! I would like to make chocolate pudding with my nieces when they visit. I would love to start making my own soups, especially now the cold weather is here. id like to try out some different soups. im not a great cook but having this would inspire me! Oh yes! I love a good spelt recipe, it makes it so much easier for me and my husband to enjoy without fear of bloating! I really want to give Apple crumble another go, and I’m sure if I had this it would certainly turn out a lot better than the last one I tried to make by hand! Would love to make gluten free pastry,I find it hard to make it by hand to get that elasticity texture. I would love to make some delicious pesto, owning this would make it much easier! I’d make a blackberry and apple oaty crumble! I’d make an apple and rhubarb crumble. I’d love to try making some houmous, as I love it, and a decent blender would be ideal for this. I’m fairly new to baking and i’m loving it. I would love to do more adventurous bakes and cakes especially cheesecakes but my hand mixer the cheesecake seems to separate. I checked online and they said l need a decent mixer, so would really love to expand and carry on with my baking journey! . i would use it to make a hash brown based pizza. The potato and onion take ages to by hand this would do that trick no problems! The apple pie looks amazing & it happens to be my fiancés favourite, so I would def make that! I’m thinking of making a dark chocolate cheesecake so this would be ideal for chopping up bourbon biscuits for the base! I’m dying to make a proper, home-made Christmas cake! We used to be given a boxed cake at work so I was never really encouraged to do one myself – well, we don’t need two cakes, do we? But now that I am semi-retired I could bake my own and I am convinced it will be miles better than the shop bought ones. I’ve got a recipe for cheese & olive scones that are lovely at Christmas but quite fiddly, any help from this food processor would be appreciated! I’m dying to make my own grated parmesan cheese. Our family uses parmesan liberally & so would be much cheaper to grate a huge quantity myself. Like the idea of using a food processor for quick work. Im desperate to give homemade mustard a go….i watched James Martin give it a go and it looked amazing! I would love to make a delicious, comforting Leek & Potato Soup, the perfect winter warmer after being in work all day! I want to make my own almond butter! My friend gave me a recipe for mushroom soup using porcini mushrooms – love to do that. I have become a vegetarian and 6 months in I am having so much fun experimenting with different foods and recipes. I have enjoyed making quinoa, butterbean fritters the most adding spices and flavours. Have also been cooking apple cake apple pie and apple chutney with the vast amount of apples in my garden. Well done. It can be a big step. But as you say lots of fun to be had discovering new ways of cooking. I’m envious of your apple tree(s). Between watching #GBBO and this article it’s time I tried some home cooking. I love making different soups, especially in the colder months. The food processor would be great for this. I’d like to make more soups now winter is here so it would be a help with chopping. I would love to make a classic vegetable soup so this would be really useful! Oh wow your apple pie looks so yummy!! Soups for winter and baby food in the new year! I would love to try out your apple pie recipe. How good does cheesy potatoes sound? Very! I would slice the spuds and grate the cheese with the processor in record time with great precision. I’m also a big salad fan and would love to try making my own dressings in the machine. With the cold weather coming first ting I’ll be making is lots of soups. Nigella always uses a food processor for her Victoria Sponge and other cakes – so I’d love to try it for that as well as to help with all the veggie dishes I love. This would be useful for all sorts of things. Homemade soup has to be my favourite and this would be ideal for chopping all those onions and tough ingredients like butternut squash. I would use it to make the pastry for my mince pies, so much easier than doing it by hand. I’d love to make lots of warming vegetable soups for the winter months! Maybe a nice fruit crumble for puddings! Would love to make snuggly comfort food this winter and quickly too! Apple crumble yum. Both my children love homemade over shop bought and their favourite is my homemade hummus especially when served in wraps with chilli bean paste (it’s a bit like refried beans) and salad. The hummus and bean paste is all prepared with a food processor but sadly I’m struggling to make it as my current one went up in smoke last month. wow! i would love to make some pastry! always been making by hand and this looks beautiful too. Lemon meringue pie. I love it and have made it before but it can be a bit of a faff. I’m vegan so lots of my recipes require a processor like this. I would make vegan blueberry cheesecake and I make the base with dates and almonds which I need to blend. I make the ‘cheese’ with blended cashews and soya milk. I would love to make my favourite Carrot Cake. The processor would be so useful for shredding and blending all the lovely ingredients! Smoothies. I buy lots of frozen fruit (like summer berries) for convenience, so a food processor would be ideal for making healthy drinks. I love making my own coleslaw but it can be a tedious process, a food processor would make it so much easier and quicker. I would love to be able to make sweet pastry from scratch so I could bake some homemade mince pies. My hands are too warm to make pastry! I love your apple pie recipe, it is my next to do bake! When I don’t have apples I sometimes use courgettes and make a fake apple pie, it’s amazing but you can hardly taste the difference! Oh, what a splendid idea Polly. Thanks for the tip. I’d love to be able to make peanut butter! I find it kinda magical he you can turn plain peanuts into peanut butter in just a few seconds!! I would love to be have a food processor in time for Christmas. I have a stack of recipes that I would love to try ranging from cakes to sauces and a processor would be a great help. I would love this super food processor to great pasty and cakes. I have arthritis in my hands and it would make much better mixes than I can do. I would love to bake a vanilla sponge cake. I have not baked for years. This would definitely motivate me. I’d like to make cakes and bread, anything really as I can’t beat mixture by hand any more as I have arthritis in my hands. I would love to use this to make the perfect Butternut Squash soup x I want to make it using our South African recipe- something I haven,t done since leaving years ago , as can’t face chopping all the squash up ! Hi Kim. Thanks for letting me know. I would love to make some different chutneys to give to some family members for Christmas, in particular a caramelised onion chutney as this is all our favourite. I would love to use it for making pastry as I hate making it by hand. I’d love to use it to make lots of delicious and warming soups to see us through the winter months. I would make my sister a special vegan meal as she deserves a treat and this would help big time. This would be great to make the pastry for my squash and mushroom tarts. I’d like to make various pastries for savoury pies. A food processor would make it so much easier and quicker.